Kenneth Ottenbacher lectures at the inaugural Rehabilitation Science Seminar on March 28. 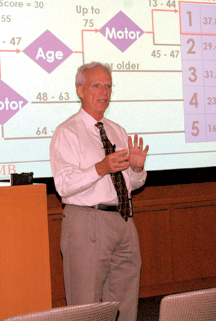 Even though rehabilitation still provides a similar degree of improvement compared to decades past, patients are entering—and exiting—rehab in comparatively worse shape, said Kenneth Ottenbacher on March 28 during the first monthly Rehabilitation Science Seminar. Ottenbacher’s research analyzed data from 1994 to 2007, using information from both before and after the implementation of Medicare’s prospective payment system, or PPS, in 2002. Based on each patient’s history, condition and prognosis, the PPS allocates a specific amount of money for post-acute care, including rehabilitation, before the patient receives care. Ottenbacher hypothesized that mortality may have increased due to changing referral patterns and possible decreases in length of acute care stays before rehabilitation. Premature discharge also can be costly in financial terms, he added. The seminar came near the end of Ottenbacher’s month-long visit to USC. The audience included faculty and students from the USC School of Dentistry divisions of Biokinesiology and Physical Therapy and Occupational Science and Occupational Therapy. At a reception following the seminar, Ottenbacher said the two divisions are uniquely well-equipped to tackle the tough challenges he addressed in his talk, especially when working together. James Gordon, associate professor and Associate Dean of Biokinesiology and Physical Therapy, agreed that a cooperative approach, especially in the relatively young field of rehabilitation science, is the most effective way to address complex patient care challenges. “What we’re trying to do is look beyond a discipline-specific viewpoint and look at patient problems in a broader context in order to treat the whole person,” Gordon said.